Not a great pic. I should have been a bit more creative! 1. Preheat oven 350 degrees. Lightly grease a baking sheet, set aside. 2. In a bowl, cream together cream cheese, Monterey Jack cheese, cumin and cayenne. Set aside. 3. In a small bowl, beat together the eggs, milk and 2 teaspoons Cajun/creole seasoning. 4. In a shallow dish, combine the panko crumbs and 4 teaspoons of Cajun/Creole seasoning. 5. In a third bowl combine the flour and remaining 2 teaspoons Cajun/Creole seasoning. 6. 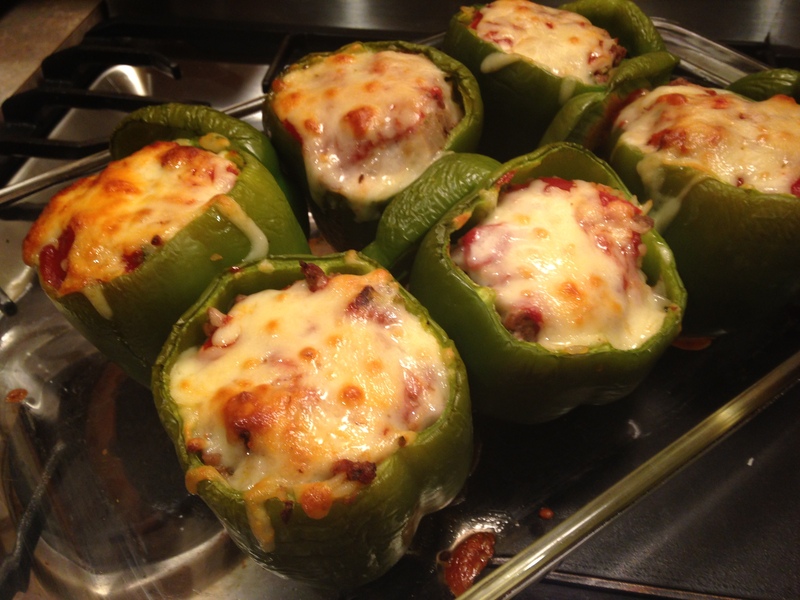 Spread 1 Tablespoon of the cheese mixture into the middle of each jalapeno half. 8. Place the coated peppers, cut side up, on the prepared baking sheet and bake until the filling is runny and the crust is golden, about 30-45 minutes. 9. Remove from the oven and serve immediately with a cold beer! The second round I did the following for the filling – 6 ounces cream cheese, 1 Tablespoon chopped chives, 1/2 teaspoon of salt and pepper. Enjoy this simple and delicious appetizer!! 1. Preheat oven to 350 degrees. Adjust oven rack to middle position. 2. Bring 4 quarts water and 1 Tablespoon of salt to boil in large stockpot over high heat. 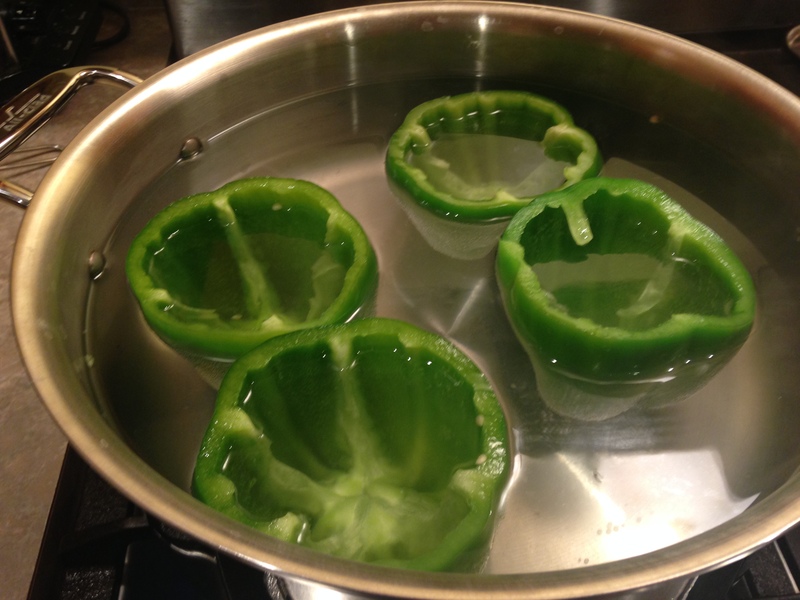 When water boils, add your peppers. Cook until peppers begin to soften, 3-5 minutes and remove with slotted spoon. 3. Set the peppers upside down on paper towels to drain water, then flip over as soon as drained. 4. Return water to a boil, add 1/2 cup of rice and boil until tender or 12 minutes. Drain rice into colander and transfer to a large bowl; set aside. 5. While the rice is cooking heat a 12 inch heavy bottom skillet over medium high heat until hot, add oil and swirl to coat. Add onion and cook, stirring occasionally, until softened and brown, about 5 minutes. Add ground beef and cook, breaking into small pieces, until no longer pink, about 5 minutes. Stir in garlic until fragrant, about 30 seconds. 6. Transfer mixture to the bowl with rice, stir in tomatoes, 1 cup cheese, parsley, and salt and pepper to taste. 7. In a small bowl stir together the ketchup and remaining tomato juice. 8. Place peppers cut side up in 9 inch square baking dish. 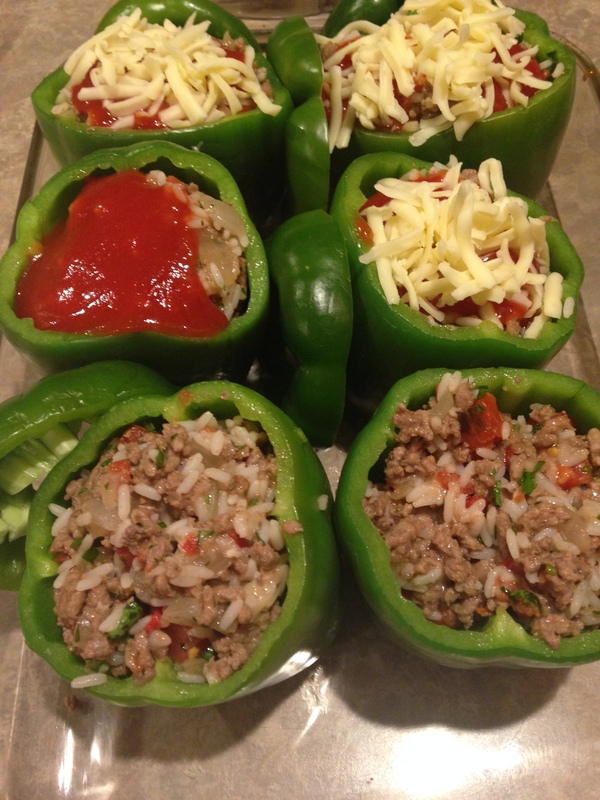 Fill each pepper with meat/rice mixture. Spoon 2 Tablespoons of ketchup mixture over tope of each filled pepper, sprinkle with remaining cheese. Bake until cheese is browned and filling is heated through, about 30 minutes. Serve immediately. Don’t limit yourself to the classic stuffing. 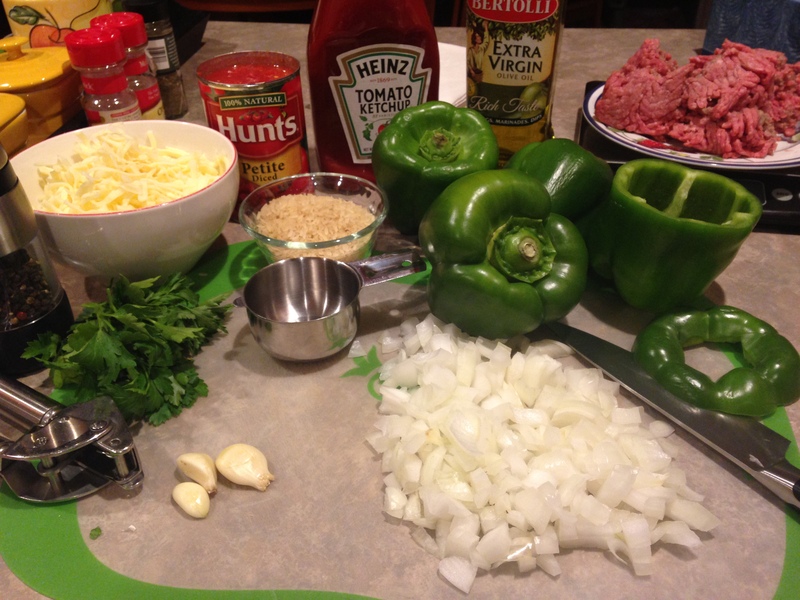 You could use any kind of ground meat, different cheeses, grains, veggies. The list is endless. Hope you enjoy this simple and delicious comfort food meal!! Chocolate and peanut butter are my favorite flavors, separate or together. 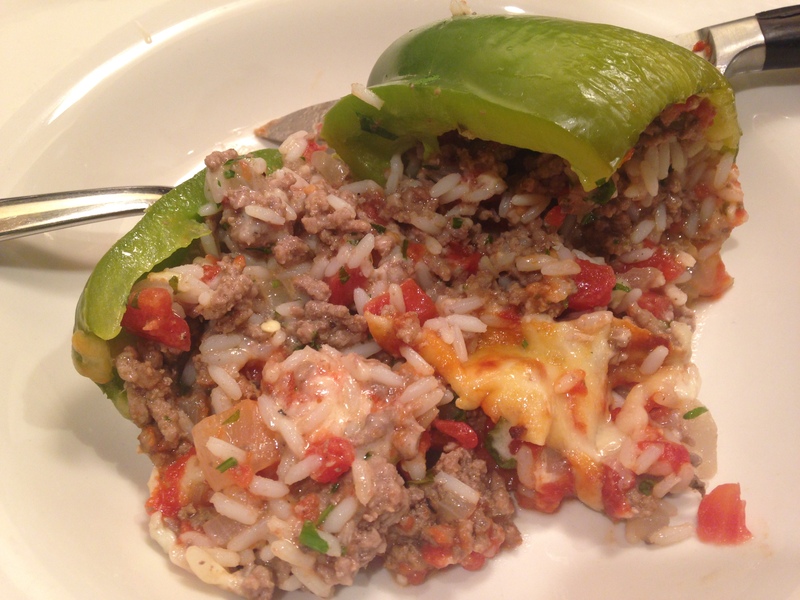 The first time I posted this recipe was May 2014. That was the last time I baked this delicious combination for a cheesecake. Brought this into work today for our Spa Day. We all enjoyed this and hope you will too! Be sure all your ingredients are room temperature before you start. The ingredients will blend together much better that way. Also, if you have a food processor it will mix together to a wonderful, creamy mixture – no lumps! Process the crackers, peanuts, bittersweet chocolate chips, and butter in a food processor. Once it comes together, turn it into a 9 inch springform pan and press into the bottom and up the sides to make the crunchy crust. Put it in the refrigerator while you make the filling. Pour the filling into the crust and bake for 1 hour. The top, only, should feel set and dry. Take the cheesecake out of the oven and set aside while you make the topping. Warm the sour cream and milk chocolate with the brown sugar in a small saucepan over a low heat. Gently whisk to blend in the chocolate as it melts, then take the pan off the heat. This takes 5-10 minutes. Spoon and spread the topping very gently over the top of the cheesecake. Put it back in the oven for a final 10 minutes. Remove the cake from the oven and cool. One of the things my mother always said to me before I left Syracuse was “take care of YOURSELF!” Now that she is gone I won’t have her to remind me. I decided to take her advice. I joined Weight Watchers (again) and am back to walking and yoga daily. I will keep that promise to myself and to her. I have to be around the next 30 years to give my kids random advice too! Here is a dish I made this evening. Simple, delicious, fast AND healthy. Add onions and peppers, saute until onions opaque. Add rest of veggies, saute until done. 5-8 minutes. Add crumbled bacon, mix together and serve. You can use any combination of vegetables you would like. Would love to hear your veggie combinations! This was really delicious. Could that be any simpler?